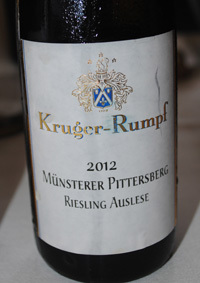 2012 Kruger-Rumpf, Riesling Munsterer Pittersberg Auslese Nahe Germany. Georg Rumpf’s fantastic 2012’s deserve a lot of attention and high praise, especially this amazing Auslese, maybe one of the best I can remember and utterly drop dead gorgeous with sublime balance and detail already. This is a wine for the ages, though very versatile in that it could be enjoyed young and in fact could partner up with certain cuisine choices right now with it’s youthful freshness, but without question there is more magic to come with time and the rewards for cellaring a few of these would pay huge dividends. The 2012 Pittersberg Auslese starts with a lovely almost delicate bouquet of lime blossom, ripe nectarine, candied pineapple and steely liquid minerals leading to a lush palate of peach flesh, apricot, papaya and sweet tangerine with subtle savory notes, sea breeze and verbena. The seductive tropical essences, mandarin oranges and honeyed pear elements only flitter in the background and the bright acidity makes everything feel dream like and surreal, though there is plenty of weight and extract to fill the mouth with luxury and hedonism, this is a profound Riesling of terrific class and character, not to be missed, don’t be afraid of the sweetness this wine is all about grace and pleasure.